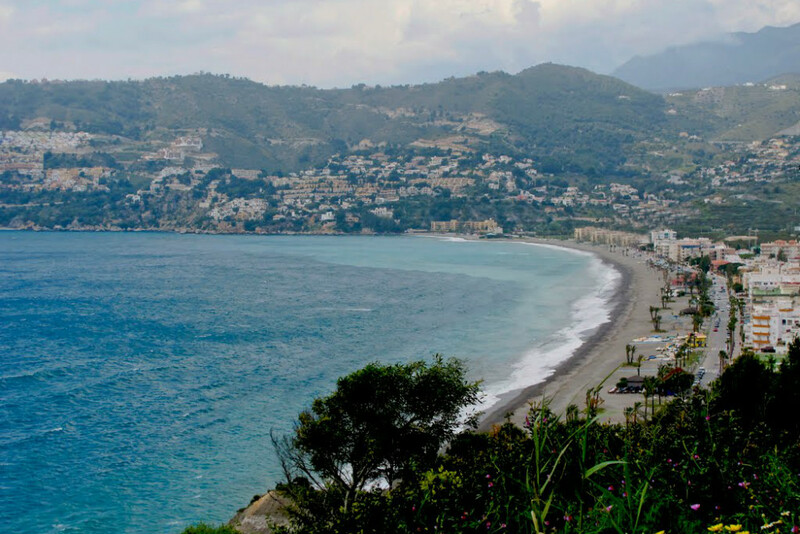 Have a look at this breathtaking selection of the best beaches in Granada. The coast of the province of Granada, also known as Costa Tropical, is famous for its favourable climatic conditions, and for the sun shining almost without interruption over the most astonishing beaches you will ever see. You can imagine unwinding here and spending some relaxing holidays on the Costa Tropical, can’t you? Come and take a look, and let yourself fall in love with their dark, pebbled or white sand and their crystal-clear, tranquil waters. You will understand why we have chosen the following ones as the ten best beaches in Granada! 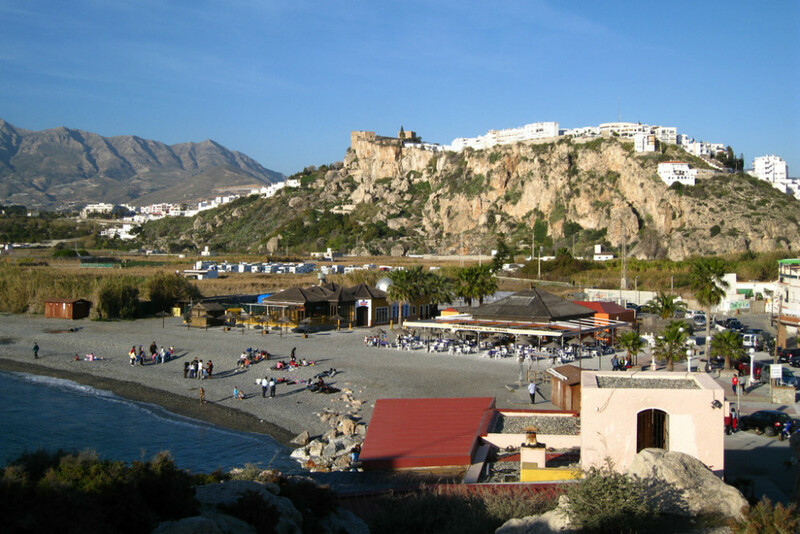 Salobreña is a famous touristic destination in the province of Granada. The peculiar medieval structure, with narrow streets, little white houses, in addition to the castle of Salobreña and the breathtaking views of the nearby mountains match with large, very well-equipped beaches. Among them, the most famous one is without any doubt the beach of the Peñón de Salobrena, an 1850 metre-long, coarse-sanded shore. The blue, crystal-clear waters gently touch the Peñón, a small island attached to the beach through a strip of earth. No wonder that it has gained itself the first position of the best beaches in Granada. The beach offers some facilities, among which surveillance service and access for disabled people. The 1200 metres of this urban beach are characterised by coarse dark sand, while its blue, crystal-clear, tranquil waters have recently gained the Blue Flag, an award given by the FEE (Foundation for Environmental Education). Thanks to the plenty of facilities provided (toilets, showers, footbridges, cleaning, surveillance and rescue services, as well as a Red Cross stand and access for disabled people), the beach has a very high occupancy rate, especially during summer. The charming paseo marítimo, the hotels and chiringuitos, together with the 100-places parking lot and the nearby bus stop, will make you love this beach even more. Now you know why you find this beach in this selection of the best beaches in Granada. Cantarriján. 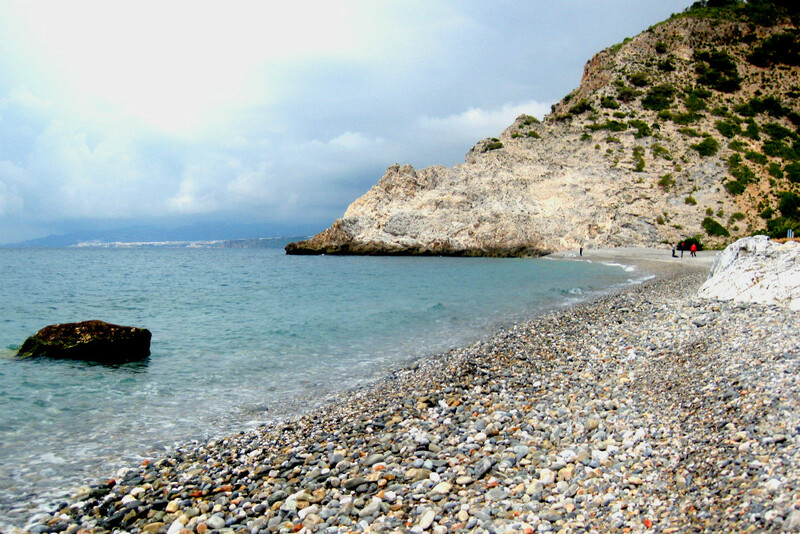 Photo by Ana C.
This small beach (it measures only 380 metres long) finds itself in the Natural Park of Maro-Cerro Gordo, about 79 km far from the city of Granada. Its sand is both fine and coarse, while its waters are crystal-clear and tranquil, so much that scuba diving is one of the most common activities, also thanks to the fishing prohibition. The beach is normally quite frequented, despite the access not being that easy. The most common ways to reach the beach are by car (there exists a 50-places parking lot), by bus (shuttles from the parking to the beach are available) or by boat. On the beach, where nudists and no-nudists get along with each other without any problems, you can enjoy breathtaking sunsets. The beach of Cantarriján provides its visitors with plenty of facilities and services (showers, toilets, sand and water cleaning service, footbridges, and hammock rental service), in addition to bars and chiringuitos, the typical Spanish restaurant on the beach. 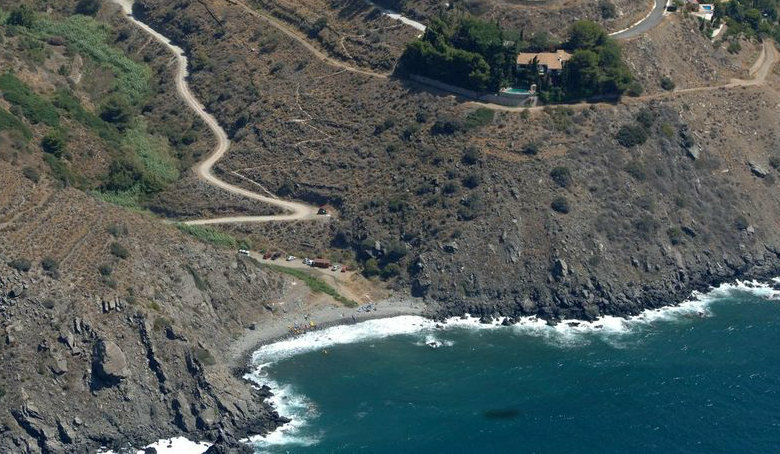 This 2050 mt-long beach lies at the foot of Sierra de la Almijara, 7 km far from the city of Almuñecar. Its dark sand mixes with gravel in a surrounding full of vegetation. The occupancy rate is medium-high, being an urban beach. The services (surveillance service, local police, rescue service) and the facilities provided (hammocks and umbrellas rental service, showers, toilets, cleaning service, footbridges, children-friendly areas and some chiringuitos) make it an unmissable place to visit if you are spending your holidays in Granada. You are offered extraordinary views while walking on the paseo marítmo, in addition to access for disabled people, and a parking area. Moreover, the nearby bus stop matches with the Puerto Deportivo Marina del Este, a sporting centre where you can practice scuba diving. Last but not least, this area and its seabed have been awarded the Q de Calidad Turística (a prize that marks the quality in the Spanish touristic sector), mainly thanks to the protection of endangered species and the coral reef. The sanded-and-graveled 600 metres of the small cove of La Joya (The Jewel) are surrounded by a cliff and rocks that protect them. The difficult access (you have to go down a 200-step staircase) and the complete absence of facilities and services are the most peculiar characteristics of this virgin beach, where people are used to naturism. 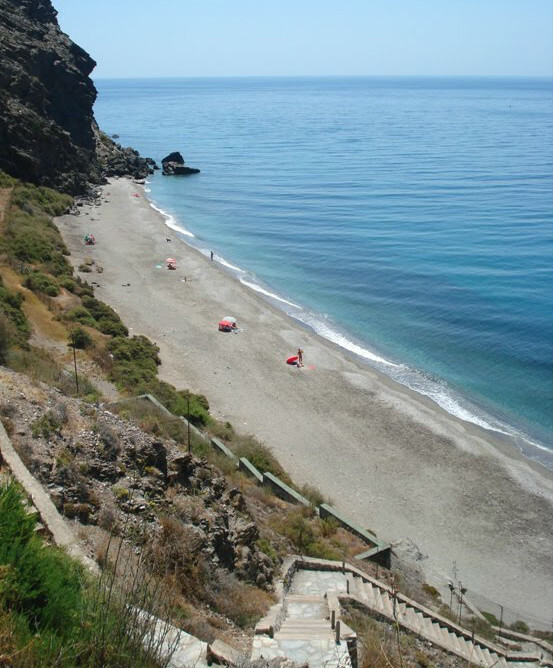 This 250 mt-long bay is 20 km far from Motril, and it is considered as one of the best beaches in Granada. 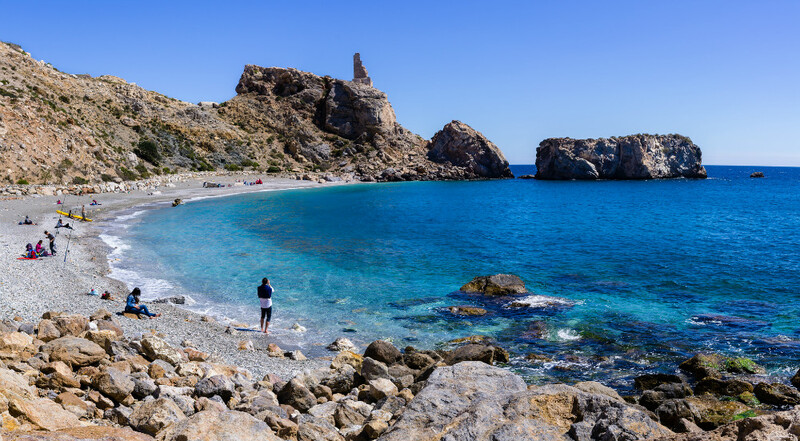 The beach is an ideal place to practice snorkelling or scuba diving, being its waters incredibly crystal-clear and quiet, in addition to being not very famous and lacking in infrastructures. And that’s precisely the reason why the natives love this area so much! The only service provided is a small chiringuito, where you can enjoy a rich pescaito frito, or drink a cocktail while filling your eyes with the breathtaking views of this unspoilt little bay. The 1100 metres of dark sand are one of the peculiar characteristics of this quiet but charming beach. However, that which stands out the most is the presence of picturesque huts, built by neighbours who want to spend a relaxing day at the beach. In addition to the possibility of barbequing or cooking yourself some tasty espetos, the beach offers you lots of facilities, among which we can underline surveillance and rescue services, parking and kayak rental service. 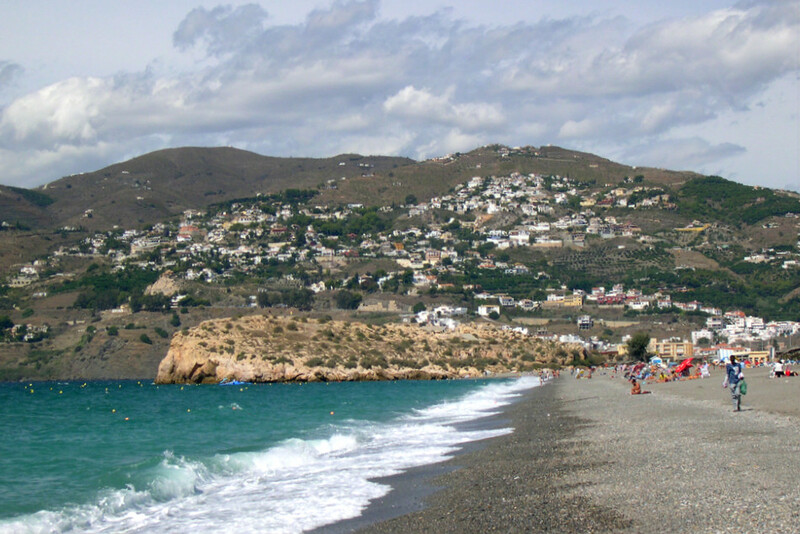 This dark-sanded beach, also called La China, extends for 1100 metres in the urbanised area of Almuñecar. Its shores are gently washed by crystal-clear waters and are surrounded by lush vegetation. It is usually very frequented and offers plenty of facilities, such as surveillance and rescue services, local police, showers, toilets, hammocks and umbrella rental service, beach cleaning service, bins, children-friendly areas, and some chiringuitos, where to taste delicious pescaitos fritos. Previously called Lance Nuevo, this 200 mt-long beach owes its new name to a URSS soldier, who fled from the regime to this bay in 1921. Its low occupancy rate is due to the total absence of facilities, as well as the difficulty in reaching it. You can go by boat, or on foot, by descending a dangerous path. Nevertheless, this beach owns warm-dark sand as well as calm, crystal-clear waters that are ideal if you fancy taking a bath since its shores are extremely safe. The name of this only-86-metres long beach refers to the nearby urban agglomeration of Torre del Cambrón, while the city of Granada is more than 60 km far. On this gravelled beach you won’t find any facilities, there is no paseo marítimo, and the closest parking and bus stop are 2 km far from it. That is why you’d better keep in mind the telephone number of the nearest Red Cross stand (+34 958 82 59 60). After enjoying every one of the best beaches in Granada, you deserve a relaxing place where to recharge batteries. Therefore, you should take a look at the best holiday homes in the province of Granada and choose your favourite one! You have just read about 10 of the best beaches in Granada. Make sure to visit all of them if you are spending your holidays in the province of Granada! What do you think about them? 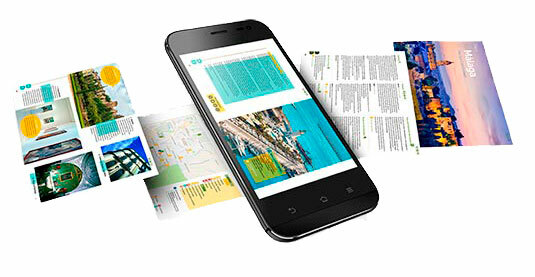 Leave a comment if you want to add something or just tell us how you feel about it. We want to know your experience at one of the best beaches in Granada! Good day! This post couldn’t be written any better! Reading through this post reminds me of my good old room mate! He loved Granada! Thanks for sharing! All these names of beaches I have noted and will visit them then will enjoy along time in Granada, Spain. I will visit all these one by one.